Luna Nuova is a blend of African, Indonesian and Central American decaffeinated coffees. Luna has a deep, rich, sweet chocolate flavor. 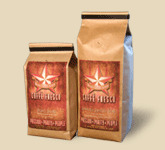 The crema is a dark caramel in color, and the aroma is teeming with both floral and chocolate notes. temporarily sold out. looking to have it restocked by mid february sorry for any inconvenience.